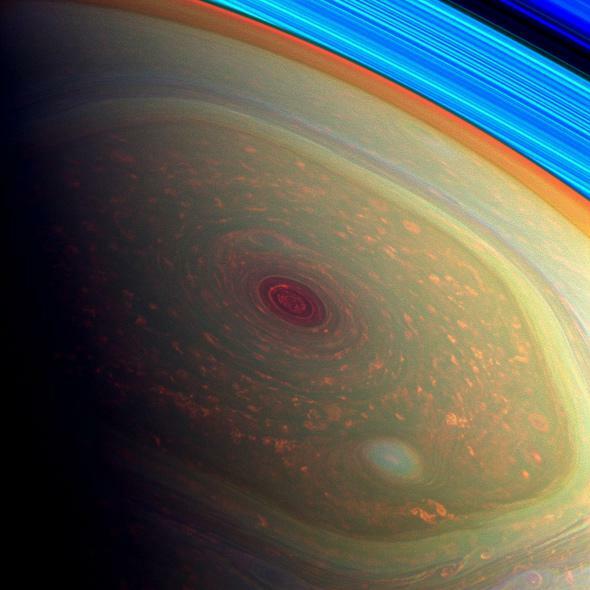 New infrared image of Saturn’s huge and beautiful hexagonal wind system. 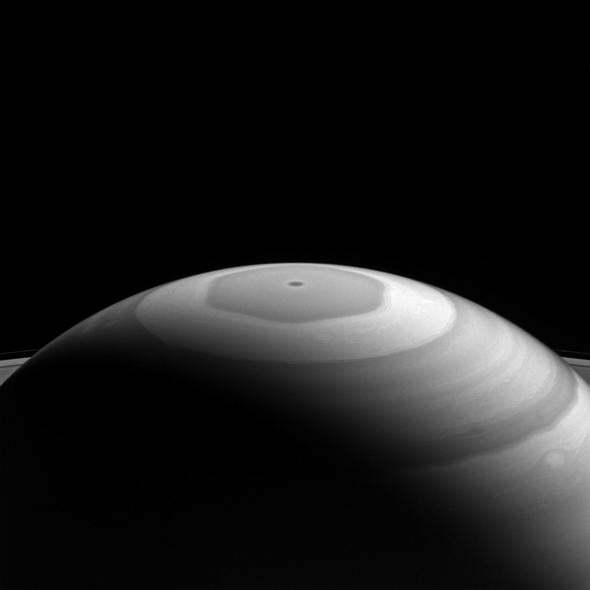 A weird hexagonal cloud pattern circumnavigates Saturn’s north pole. Note the rings just squeezing into the frame. Two things I love: astronomy and cool clouds. I love them even more when I can enjoy both at the same time. The image above is of Saturn, taken by the Cassini space probe on Sept. 5, when it was about 1.4 million kilometers from the planet, using its wide-angle camera equipped with a filter that lets through near-infrared light. This is just outside what our eyes can see, and it emphasizes the location of methane gas in Saturn’s upper atmosphere. That hexagon, though! It’s so creepy looking, like it’s artificial, a construct. But it’s natural. It’s something like our jet stream, a circulating wind pattern that blows around the planet. These are called Rossby waves, and they’re powered by the planetary rotation. You also need a sharp wind gradient, a rapid change in wind speeds. On Saturn this happens at high latitude, near the north pole, which is why the hex forms there. Boom! Hexagon. How cool is that? Of course, Saturn’s hex is somewhat bigger: It’s 20,000 kilometers across, big enough to swallow the Earth with plenty of room left over. The enhanced color view is staggering too. See that white spot to the lower right? It’s bigger than Texas. So there’s your scale for you. Saturn is immense. By the way, it looks like Neptune has a well-defined hexagon at its south pole as well. I still haven’t been able to confirm this, but the image of it is pretty compelling. Uranus and Neptune aren’t as well observed as Saturn, because we don’t have orbiters there. Cassini has been tooling around Saturn for 12 years now, so it’s seen a lot. The mission is scheduled to end next year, but it’s been one of the most successful space adventures humans have ever undertaken. And the stuff we’ve seen from it … Saturn will continue to mystify us for generations. I am constantly surprised by how the Universe can constantly surprise us. That may be one of the most fun aspects of science.